With the Workspace Template feature, all Account Owners and Workspace managers will be able to select one or multiple Workspaces and Boards from their account and save them as Templates. They can re-use and apply them to the same account or each external account associated with their email address registered in Kanbanize. This feature is very useful for users who have successfully created and adapted workflows and need a fast and easy transfer of their setups and structure. Moreover, they can use one of the built-in templates in the panel that cover 6 different scenarios. Open the Retractable menu at the bottom right corner of your Dashboard and select "Manage Workspace Templates" to display the corresponding panel. The "My Templates" menu allows you to create your Templates. This means to select an existing Workspaces and boards from your account and to re-use them in the same or another account. How to create the Template? STEP 1: Click the (+) CREATE TEMPLATE icon to show the Manage Workspace Template panel. The panel (Img.1) displays all existing Workspaces in the account. All of them are visualized through blue ribbons. 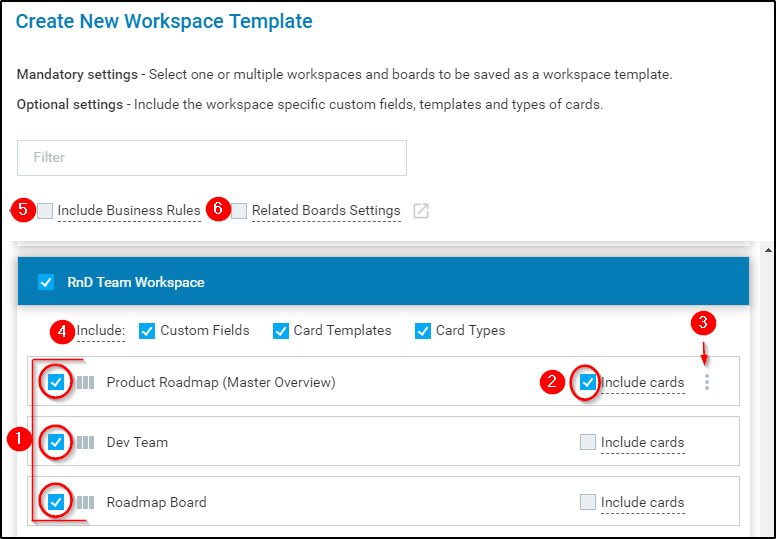 STEP 2: Select one or multiple Workspaces that you want to save as Workspace templates. STEP 3: Upon Workspace selection, the system displays a list of all boards that belong to that Workspace. (1) Select the Boards that you want to include in your Template -> checkmark the corresponding boxes. (2) If a user checkmark the "Include cards" option - all cards from the "Backlog", "Requested", "In progress", "Done" and "Temporary" archive sections will be added to the template. NOTE: All card details will be included except for the card comments and assignees. Include Card Links - all links to other cards and initiatives will be preserved. The only condition to have all linked cards present is to select all boards that hold the related cards. Include Initiatives - all cards (initiatives) in the portfolio lane will be included. Include Sub-tasks - all sub-tasks will bе preserved and included. 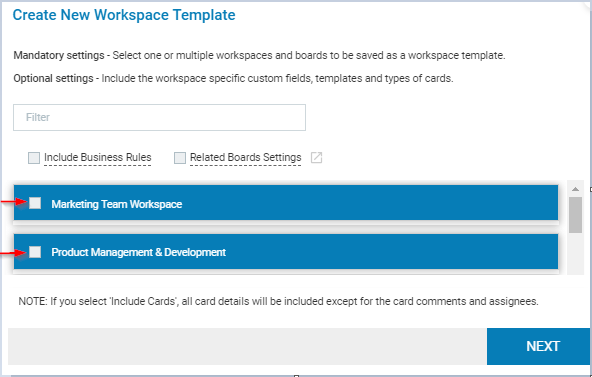 (4) Users can choose which workspace settings to include in the template: Custom fields; Card templates; Card types. 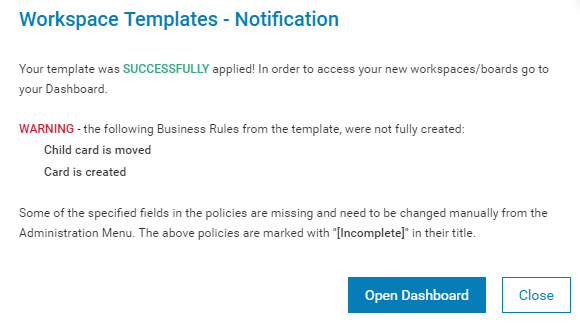 (5) Include Business Rules: Checkmark this option and all active Business rules configured for the selected boards will be included in the template. NOTE: After applying a template which contains Business Rules, they will be created, but need to be enabled manually from the Administration Menu. (6) Related Boards Settings: Checkmark this option and the Related board's configuration will be included for every board part of the template. 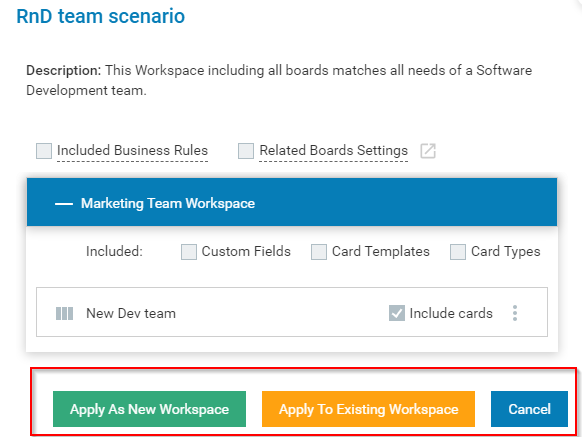 NOTE: if a board from the Board List configuration is not included in the Workspace Template - it will not appear as a Related board. STEP 4: When you configure the template settings -> click Next to proceed further. If you want to share this template with other users in the current Kanbanize account, you can type their Kanbanize usernames in the "Share with other users" box. Click on the "Save" icon and you will get a system message that you have created your Template successfully. 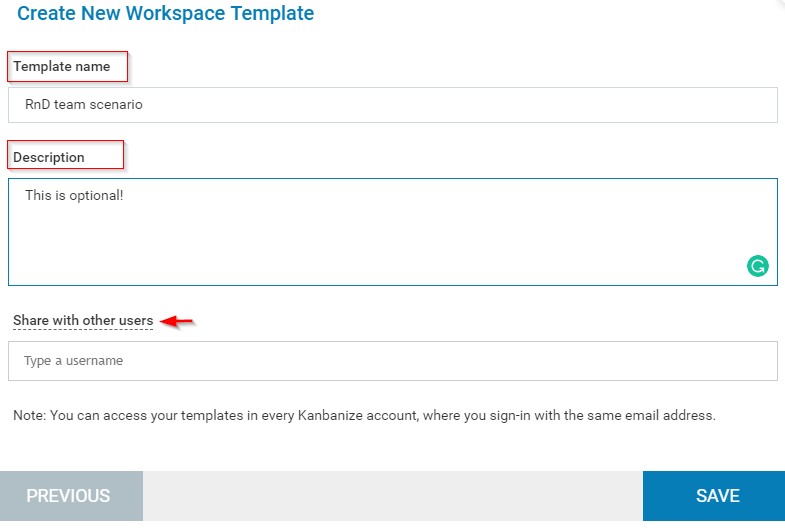 Important: You can access your templates in every Kanbanize account, where you sign-in with the same registration email address. Go to My Templates tab section and you will find all saved Templates to the right side of the panel. How to reuse the template? - Apply the template as a "New Workspace" - it will be available on the Dashboard. - Apply it to an Existing Workspace - only boards from the template will be added to an existing Workspace. You have to select the existing Workspace (receiver) from the supporting panel. Make your choice and apply the template. All Workspace and Boards created/applied with the Workspace Templates feature will be made available on the main Dashboard containing the word [Workspace] in their names. Important: In case some of the specific fields in the business rules are missing (for example: type, template), the system gives a warning message while applying the template. The user who has applied the template has to carefully review their setup (Administration panel - > Business Rules) and configure the rules in accordance with the use-case scenario. Rules with missing fields are marked with "[Not Completed]" in their title. You can manage each of the templates from their corresponding settings menu. - the Apply as New Workspace option will instantly apply the Workspace including all of its boards to your account. They will become available on the Dashboard of your account. - with the Apply to Existing Workspace option, only boards from the template will be added to an existing Workspace. You have to select the existing Workspace (receiver) from the supporting panel and to consider the Workspace settings. - the View Structure option gives a description and an architectural overview of the selected template/scenario. This menu will be active only if a Workspace template has been shared with you.